A South Carolina man might have shot more people inside a nightclub if it weren’t for another patron. The patron, who has a concealed carry permit, fired back at Jody Ray Thompson and hit him in the leg. 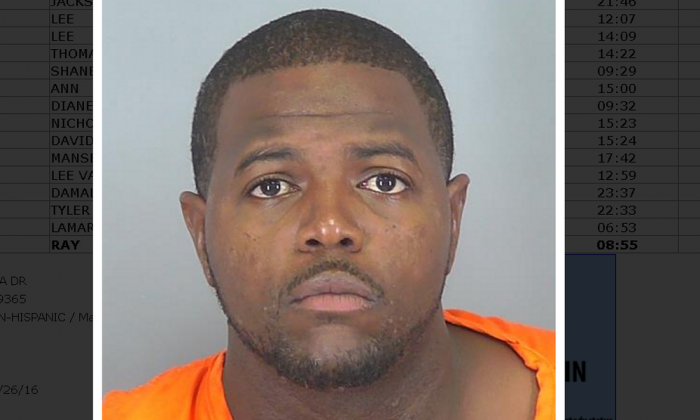 Thompson, 32, of Lyman, S.C., was arrested on June 26 for four counts of attempted murder, possession of a weapon during the commission of a violent crime, and unlawful carrying of a weapon. He is currently being held at the Spartanburg County Detention Center, the Spartanburg County Sheriff’s Office said. Thompson allegedly pulled a gun during an argument and shot three people in a gathered crowd inside the club. A fourth person, who was not named by police, the concealed carry holder, pulled out his pistol and opened fire, said Lt. Kevin Bobo with the Spartanburg County Sheriff’s Office, according to WISTV. “His rounds struck three victims, and almost struck a fourth victim, who in self-defense, pulled his own weapon and fired, striking Thompson in the leg,” Lt. Kevin Bobo told WISTV. Bobo said the individual who shot Thompson won’t face charges as he had a valid concealed weapons permit. The defensive shot wasn’t fatal but ended Thompson’s rampage, Bobo said. How Often Do Gun Owners Stop Mass Shootings? In 2012, a similar incident unfolded in Spartanburg. Jesse Gates went to his church armed with a shotgun, and kicked down a door, but concealed-carry license-holder Aaron Guyton took out his gun and shot Gates. Other people then disarmed Gates. There have been a number of cases where concealed carry holder possibly stopped a mass shooting. It’s worth noting that in some of these cases, it’s unclear if the gunmen would have shot more people. In Chicago last year, an Uber driver shot and wounded a man who opened fire on a crowd of people. In 2014, a psychiatrist, Lee Silverman, shot and took down Richard Plotts in a hospital near Philadelphia. “If the doctor did not have a firearm, (and) the doctor did not utilize the firearm, he’d be dead today, and I believe that other people in that facility would also be dead,” Delaware County D.A. Jack Whelan said at the time. Two years before that, concealed weapons license holder Mark Ktytor, a bar patron, shot William Allabaugh in Plymouth, Pa., after he killed a man in an argument after he was ejected from the bar. “The video footage and the evidence reveals that Mr. Allabaugh had turned around and was reapproaching the bar. Mr. [Ktytor] then acted, taking him down. We believe that it could have been much worse that night,” Luzerne County A.D.A. Jarrett Ferentino said at the time.